Orbital ATK's unmanned Cygnus space capsule departed from the International Space Station on schedule Tuesday, three months after delivering 7,500 pounds (3,400 kilos) of supplies, material for scientific experiments and equipment to the orbiting outpost. Cygnus also is to release five nano satellites known as "LEMUR CubeSats" that will form part of a constellation of satellites tracking maritime traffic and weather. Cygnus will remain in orbit until Wednesday June 22, when its orbital engines will be activated in a series of maneuvers to cause it to plunge into the atmosphere and disintegrate over the Pacific. 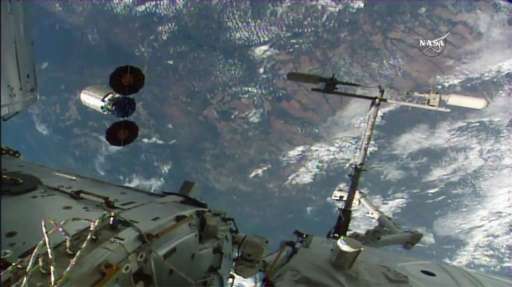 The material and equipment that Cygnus delivered in March were used in experiments by NASA and other research entities in biology, biotechnology, physics and Earth sciences. The research in microgravity will be relayed back to Earth where the findings will help in preparing a manned mission to Mars. Cygnus was launched March 22 aboard an Atlas V rocket from Cape Canaveral by the company United Launch Alliance. It was Orbital ATK's fifth resupply mission to ISS for NASA.